AURIN presented at the Department of Premier and Cabinet (DPC), Enterprise Solutions Branch for their inaugural “Our Directions” seminar, a forum to talk about information and technology in the Victorian Government. The DPC Enterprise Solutions produces standards, policies, and governance frameworks for Whole of Victorian Government (WoVG) shared services and information and communications technology (ICT). The branch also identifies future opportunities in these areas and reports on significant ICT investments and shared services. The topic of the seminar “From Data to Insight – using data to improve decision making, policy development and service delivery” presented an excellent opportunity to advocate for the importance of the development of AURIN’s services to the research community in unlocking data and providing tools for analysis. A recent example of use of our infrastructure is the work we have undertaken on the “Supporting Interface Families Project” completed on behalf of Interface Councils. Jack Barton presented alongside the project leaders Craig Kenny, Director of 42squared and Raeph Cummings, Community Infrastructure Planner at Moorabool Council. The Interface Councils are a group of ten municipalities that form a ring around metropolitan Melbourne and face challenges of growing populations and resource constraints. Policy developers, information and data specialists, geospatial specialists, business analysts, IT and IM leaders all gathered to hear how AURIN has connected these councils with data and analysis that provides insight to help them make decisions around services and infrastructure. AURIN Portal showing data mapped for all 10 of the Interface Councils. Residents living in these outer suburbs are currently experiencing a lower quality of life than those living in the inner suburbs due to an imbalance of basic services and critical infrastructure services and the Interface Councils are working to equal this imbalance. 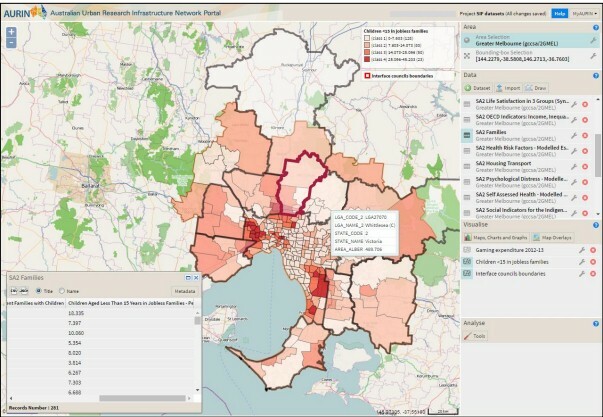 Data provided through AURIN by the Interface Councils Social Indicators workbook and data analysis and visualisation undertaken using the AURIN Portal provided evidence for informing policy. As all government employees can enjoy free access to AURIN, it is easy to share this data. A key data gap that emerged in the project research was access to service level data from the Department of Health & Human Services. In the past DHHS has rarely allowed service level program data to be accessed by external agencies and where this occurs there are significant negotiations and internal authorisations around what data is published and how it will be used. AURIN’s flexible securitised data access infrastructure ensures that sensitive service data is accessible, secure and able to be used constructively in a controlled manner. Unfortunately access to this data was not available in time for the completion of this report, however AURIN can now offer the research community the opportunity to apply for access here. Here Health Direct provide an extensive database of medical, clinical and support services across Victoria. The data is current, comprehensive and is considered to be a reliable broad indicator of comparable provision for health services. AURIN is free for all Australian Government, local, state and federal, to use. For access please contact us here. You can download the full report on “Supporting Interface Families Project” here. This entry was posted in Announcements, Data, Government, Health, Housing, Latest News, Metadata, Socioeconomics, Urban Development. Bookmark the permalink.